Mobile Marketing Magazine has revealed the nominations for the 2018 Effective Mobile Marketing Awards. We are excited to announce that for the second year in a row, S4M is shortlisted in five categories. Both our Sony Pictures and LEGO campaigns have recently received an award. Fingers crossed for our Pernod Ricard’s first. The Effective Mobile Marketing Awards ceremony is a night dedicated to celebrating the excellence of mobile marketing and the brightest talent in the industry. The event will take place on November 15th in London at the brand new Grange Tower Bridge Hotel. This year, there are entries from more than 20 countries, and over 100 campaigns are nominated in the 28 categories. Let’s not forget The Grand Prix, an award given to the best entry submitted across all categories. It is sure to be an exciting night. Congratulations and best of luck to all the nominees. 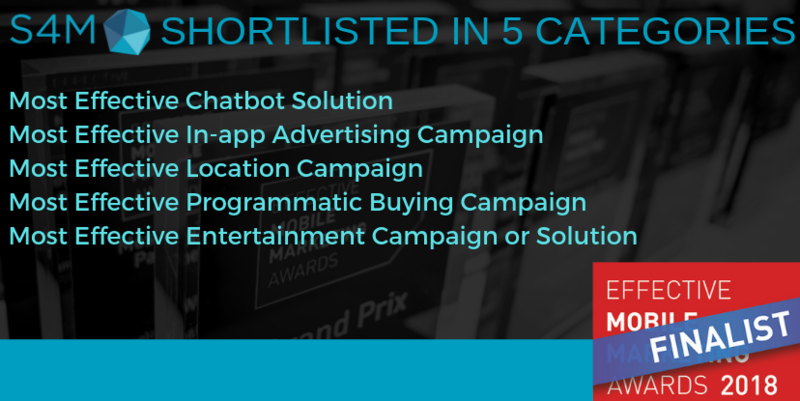 You can find a complete list of the shortlisted campaigns here. Stay tuned for the results! To learn more about the individual drive-to-store campaigns, have a look at S4M’s Case Studies page.